Surpass Certification: Level 1, is designed to assess users' knowledge of core functionality in Surpass. Questions will cover the end-to-end process for creating, delivering, marking and reporting on assessments delivered through Surpass. If you've recently received full Surpass training, all of the test content will have been covered by your trainer. 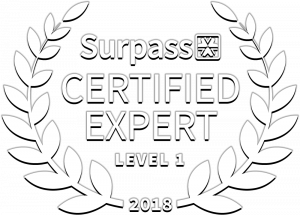 Surpass Certification: Level 1, is a great way to test your knowledge of Surpass, affirming your learning and ensuring you have a trouble-free experience with Surpass going forward. It's also a good opportunity to identify any areas of Surpass that you may be less confident in. The test is open book, so you can make use of all the Surpass help resources if needed, including the in-built help, Knowledge Base, and Learning Portal. The test is delivered on-screen through Surpass. All the questions are multiple choice, and are worth one mark each. The sample question below will help you to understand the type of question that will appear in the exam. Question: In Surpass, tabs across the top of the screen are used to navigate between different parts of the system. When different users log in, they may see different tabs. Which of the below factors controls which tabs and screens a user will see? Answer Options: A: The centres that they are associated with. B: The subjects that they can access. C: The permissions that they have been assigned. View the 'Studying for the Exam' page for more guidance on how you can prepare for the Surpass Expert Exam, and a breakdown of the topics covered. To register for Surpass Certification: Level 1, please complete the form below with your details. The test will then be scheduled for you, and you will be emailed details of how to access it. We will send your details for accessing your Surpass Expert test to this account. Please see below our Privacy Statement, which is a description of how your personal data will be used when you sign up to schedule a test in Surpass. Please tick here if you understand and accept BTL’s use of your personal data in this way. This is a description of how BTL collects and uses your personal details that you input into the form to enable you to schedule a test in Surpass. Transferred to Google Sheets (a Google Inc spreadsheet product). This is a service that BTL uses to help us to capture your data so that we can understand who has scheduled tests in Surpass. If you would like more information about how Google Inc will process your personal data, please see the note* below. Transferred to Surpass.com, a hosted web service which BTL controls. This is the web service in which you will take your test in Surpass. Transferred through Zapier Inc’s integration service. This is a service that BTL uses to automate data flow between online software applications, in this instance from Learn.Surpass.com to Surpass.com to Google Sheets. We use this service because it helps us to manage data more easily. If you’d like more information about how Zapier Inc will process your personal data, please see the note* below. The result of the above data capture and transfers are that BTL will send you information on your Surpass assessment to the email account that you have nominated. The email will provide details of how you can log in to Surpass to take your test.